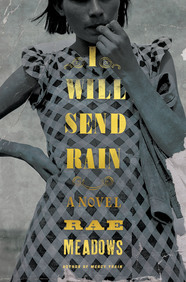 Today’s Maximum Shelf Awareness feature is I WILL SEND RAIN, from acclaimed and award-winning author Rae Meadows. I WILL SEND RAIN is a BEA 2016 “Shout ‘n Share” pick & an August 2016 Indie Next pick! Click here to read the full Shelf Awareness summary, review and full interview with Rae Meadows. I WILL SEND RAIN will be available from Henry Holt & Co. on August 9, 2016.